Thank you Split Rock Ranch for bestowing on me the One Lovely Blog award :) I really enjoy reading your fiber adventures too, and enjoying the adorable llama eye candy. I have been knitting lately, even though I'm busy preparing for a big dyeing project as well as trying to find some summer work. Mostly I'm working on a shawl to wear at my cousin's wedding in September. The pattern is Wings of a Dream, a variation on the Swan Lake mystery stole, with two wings instead of one. I'm knitting it in Colourmart's cashmere-silk yarn. I'll take some more recent pictures soon, but you can see the start of it in my previous post. Wings of a Dream was slow going for a long time, but I have now started one of the wings and the pattern is getting easier. The center section was all about following a chart, but the wings are a little more self-explanatory. Once I get to the bottom edge, I will be adding some silver Japanese seed beads to the last few rows of feathers. The Rainbow Magic Ball Entrelac Scrap Afghan! It's nice because now, Entrelac is totally mindless for me. I've done probably 60 squares by now. The best thing about this afghan is that the yarn cost was absolutely $0. It's created entirely out of my yarn scraps, using the Magic Ball method. 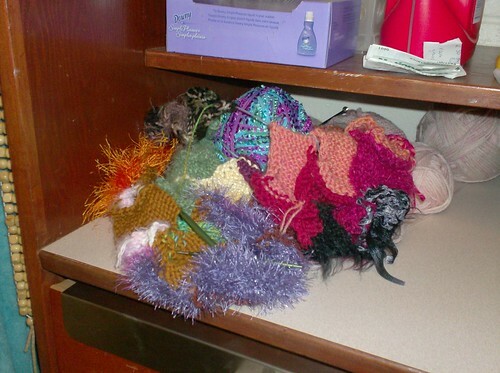 Magic Ball knitting is where you knit from a ball of bits of all different kinds of yarn. What I did was I took all my scrap yarn from various projects, sorted them by color, and tied the ends together rainbow-wise. So my magic ball scrap afghan will contain little bits from almost all of my knitting projects, to serve as a memory for me of everything I've knit. great knitting you have there! P.S. 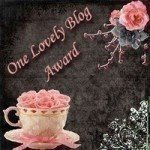 Congratulations on your blog award! What beautiful knitting. It makes me think that I should probably dig out my knitting needles again after their many years of collecting dust.